The first thing that was changed was the logo, which needed to communicate in a very explicit way, the idea of mental development and wit, while also giving some hints about the crunchy texture of the product. The light bulb used as a symbol for ideas and smartness was added to the word chocolate to make a link with the part of the product that delivers this benefit. 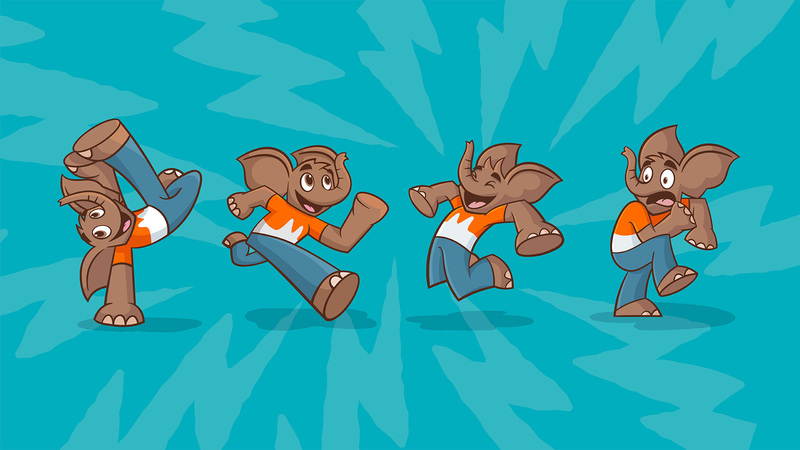 We also knew that we needed a character that achieved a true connection with kids, and we concluded that Melvin’s current graphic style seemed disconnected from what kids are watching, reading and experiencing today. 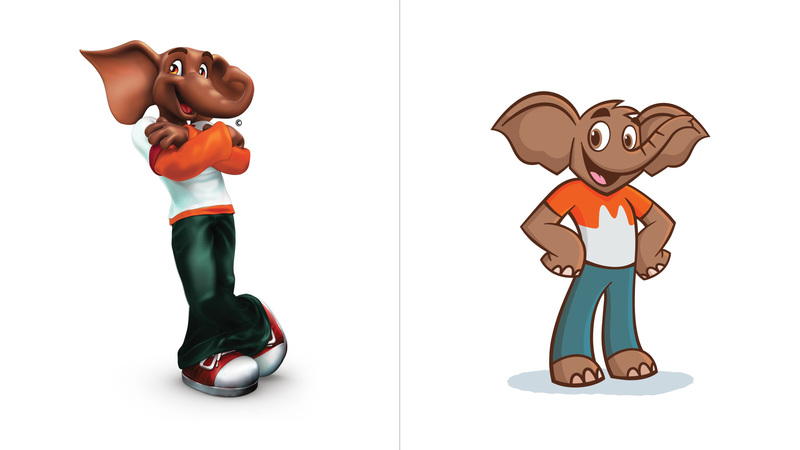 Therefore, we evolved the illustration to bring it closer to the graphic styles’ kids are familiar with and also created a powerful story behind Melvin. His new role is to actively participate as part of a group of kids (he is a kid now!) in which he represents the product’s benefit via his wit and agility (mental and physical); every time he and his friends are presented with a difficult and real situation (not fantastic as it used to be) he comes up with an idea (I know! !...what if??) and it’s with the help of his friends that they bring the idea to action as each of the kids represents a different type of intelligence. Making evident that all kids are agile in different ways (mentally and/or physically) and that makes them all special. Visually, Melvin needed to convey the idea of physical agility in a way that didn’t look weird for an elephant, so exaggerated perspectives and balanced proportions were used to achieve this. 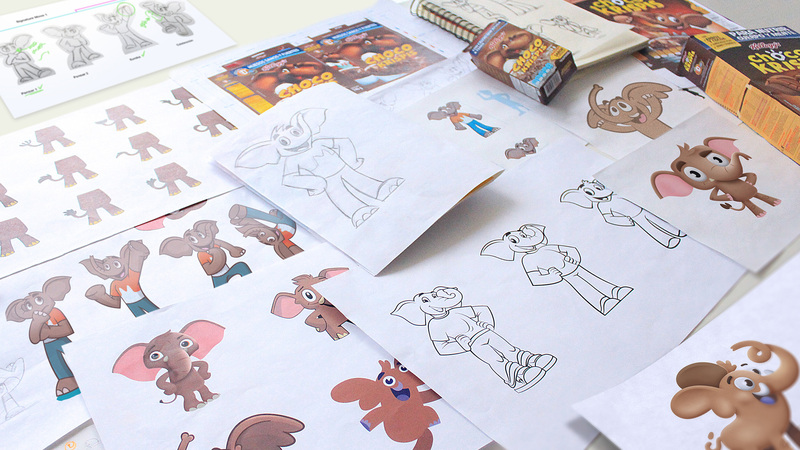 Melvin is also the source of the new visual territory of the brand which represents the way Melvin and his friends think. 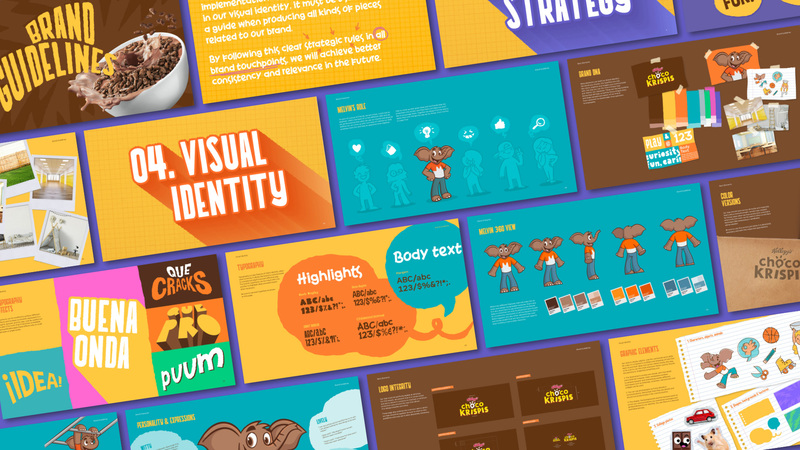 While the character lives and interacts in the real world, he and his team affect it through their ideas, which are represented by different graphic elements: Expressive typefaces and backgrounds to create onomatopeiae for their “eureka” moments; Sketchy illustrations and cutout pictures to make plans fast and put them into action; Bright colors to make everything more fun. 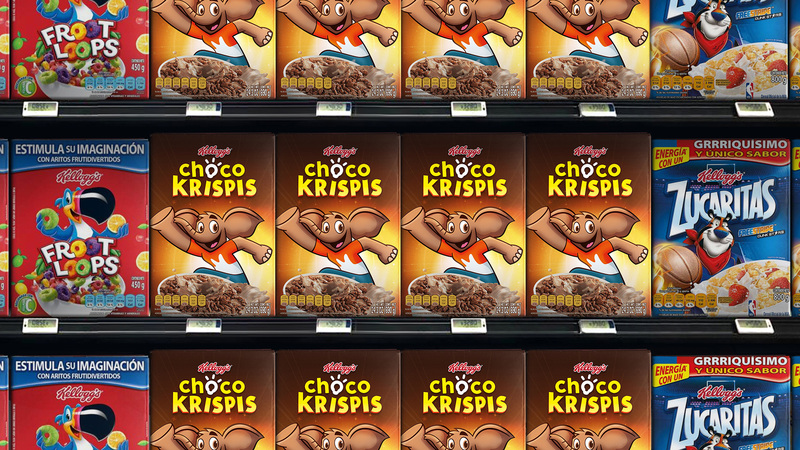 Disclaimer: The main reason I am posting this is because Choco Krispies was 100% my favorite cereal growing up and with every image I saved of this project and every word I am typing, the chocolatey milk this cereal created is flowing through my inner self and if I still ate sugary cereal I would be having a bowl right now. Having stated that, for no benefit of this review… the old logo had some good bones but the over-rendering made it pretty bad. 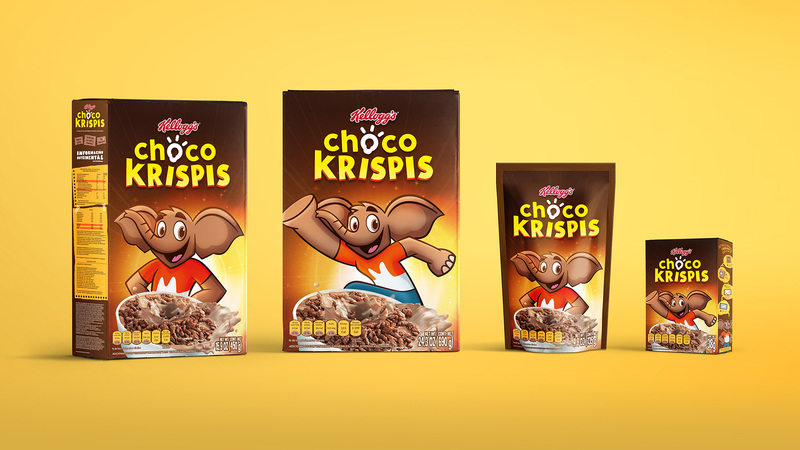 The new logo is alright… I like the “KRISPIS” part a lot as it has some good rhythm and funky details but the “choco” part falls flat. I wish they had not included the light bulb as the “O”s would have been a fun way of creating tittles. 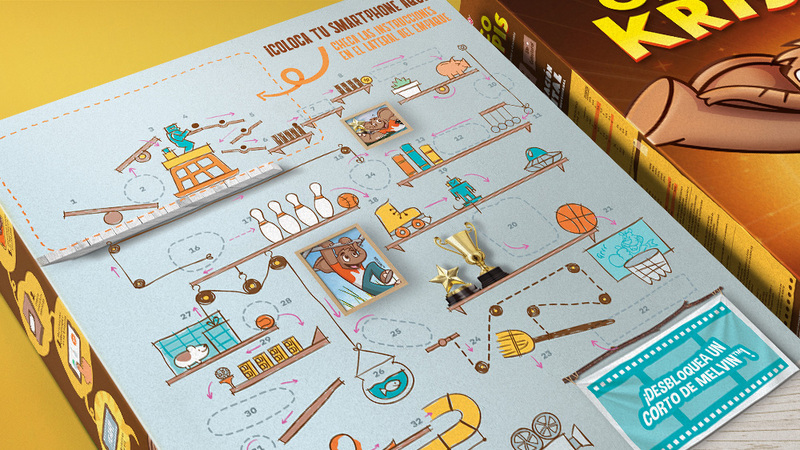 I get that the bulb represents that cocoa can make you smart but, seriously, no one eats cereal to grow their IQ. The old Melvin character was weird and creepy — look at his fingers. The new one is fun and the more “traditional” cartoon look works better. 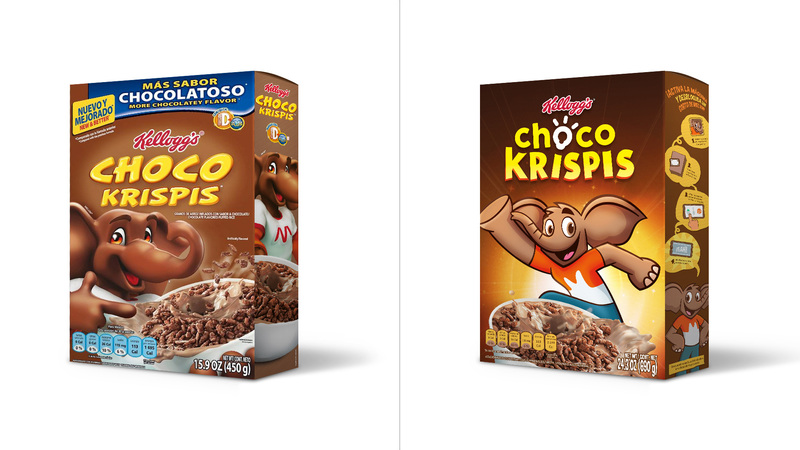 The packaging… it’s about the same, before and after, since it’s still mainstream kids cereal and it will always do what cereals do. The elements are better for sure but it will just be a matter of time before all the messaging in bubbles from the old one creep into the new one. Based on the guidelines and onomatopoeias, I get the sense that they are really trying to build an interesting brand and something more distinctive from other cereals. So, for the category, this is a job well done.